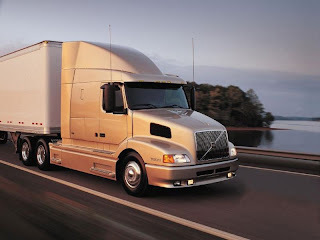 Volvo Trucks is predicting that year 2012 will be a good but choppy year for the company after reporting a three points increased in North American retail market share class 8 for 2011. The prediction is based on Wardsauto Group data that indicated a significant growth in its North America market share. 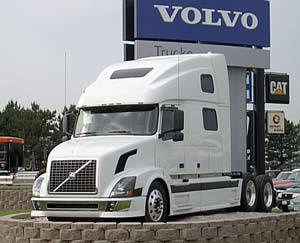 The reported increased showed that Volvo has a new high market share of 12.1% in 2011 representing the largest gain for any OEM. Volvo also managed to registered growth in its Canadian and US retail sales with 12,100 units compare to 23,820 units for 2011. In addition, its own engines and I-Shift automated transmission has successfully penetrated the market reaching a new high record of 80% and 40%. The strong year prediction has put some bluster into Volvo which has been consistently branded as a moderate brand. Ron Huibers, Volvo president of North American sales and marketing said that Volvo trucks are quite pleased with their accomplishments and happy with where they are today. He also added that the good market share is the measure of Volvo’s performance and they’ve a record level for that and they are more excited to what they have to give for their customers. Although still quiet as to the details of what Volvo has in -stored for 2012, the company expresses that its strong concentration on integration with be its driving force in moving forward. Huiber clarified that it’s not integration alone but they’ve integrated. The pointed out that the biggest example of company’s integration strategy’s success is the successful penetration of I-shift automated transmission in the market share and its steady rise over the years. He added that while many costumers have not experienced I-shift but once they do, they virtually get hooked. He said this foretells their future. Products enhancement that was introduced in early part of 2011 contributed to its success most especially the redesigned hood-mounted mirrors which gave improved aerodynamics and visibility and resulted to a 67% increased in take rate after its introduction in 20111. Magnus Koeck, vice president of marketing and brand management for Volvo added that the new lightweight fifth wheel that was developed with Fontaine and with Bluetooth standard also works well for Volvo. 2011 was a big year for Volvo and Koeck added that Volvo’s products introduction has been successful with their customer. All of their hard works has paid off while Huibers concluded that Volvo has worked well with its new auto-hauler, being a purpose built truck and it’s taking off quite successfully for Volvo. Infiniti gives auto journalists and sports car lovers a sample of what to expect and see at Geneva’s Motor Show in March 2012. Infiniti’s Boss of advanced product planning Francois Bancon commented that their new car concept is the best and the most balanced way to spread out weight and attain a high level of performance as well as handling. Although Infiniti is not releasing much information on their latest sport car concept many car enthusiasts predicted that it would run along having a 1.2 litre petrol engine and would definitely run on electric power and guesses are also up to that the car would have to be another plug-in hybrid. The power train is still framed to the concept of the car but it will most likely to take on Infiniti’s future design direction. Observers predicts that we can expect Infiniti to give us something as charming as the Essence Concept with the usual flairs of trick doors, excess slats and vents for cooling the batteries. Infiniti is putting everybody in the wait and see atmosphere. Infiniti’s Vice President Andy Palmer claimed that the sport car is all about proving on what to come next. He promised to make the waiting ends at Geneva’s Motor Show, as Infiniti will present their vision for a totally fresh idea of this inspired high performance car. He also added that soon an all -electric sedan will make a debut on the market and the natural reaction of course is to push all the limits where performance and the environment cause intersect. He reminded everybody that Infiniti’s first EV is basically a NIssan Leaf EV. Infiniti, trying to tease everybody with its latest and new sport car had released the first official photo of the sport car on January 11, 2012. They have also released news video Of Infiniti’s vice president Andy Palmer discussing their new sports car concept. Another video of Infiniti’s big man on Advanced Products Planning Francois Bancon has him telling all about what to expect and know on their new sports car concept. Infiniti bosses are confident that their new sports car will be another additional success for the company. Just like in the past, Infiniti has proven to be the car makers to beat when it comes to innovations and styling. They’re hoping that with the public’s interest on cars bouncing back their new sports car will be the ultimate car for 2012. Rapid growth of auto sales was expected to take place this year after waging graphical data done by experts in Kuala Lumpur of the Malaysian territory. As the estimated cost created by statisticians of Auto sales in Malaysia, they have expected a fall of zero point nine (0.9%) bracket in auto sales but also expected to turn things back to the same this year. A rough estimate of 2.5 percentages will be bound to achieve by the country. The industrial group was confident that auto sales would be brought back successfully in their robust and domestic economy. A total of 599,877 sales in vehicles were disrupted due to the malevolent earthquake in Japan after production last year not to mention the devastation of the March tsunami that lowered sales. The MAA (Malaysian Automotive Association) said that due to this calamities including the crippling floods that happened in Thailand took everything down including the auto production with a rough estimate of six percent starting in the year 2010. The harsh event lowered sale in Thailand and Japan, which are both the key manufacturing hubs for autos. Due to the disasters, auto dilemma disrupted the rich production of new motors and lowered the sales for motored vehicles ranging from 2nd and 4th quarter if the year 2011. According to Aishah Ahmad the president of the association, the forecast of sales growth of roughly 2.5 % was expected to happen this year of 2011 because of the expected expansion of Malaysian economy, which would be about 4.8%. The association grouped by about forty car distributors and manufacturers projected the rise of sales of 615,000 vehicles for this 2012 including a surge of 669,600 expected in the coming 2016. Aisha stated that the taking over by Proton a national carmaker of local conglomerate is the perfect move in recovery of auto sales. Honda, Mercedes-Benz and Volkswagen assembler and distributor DRB-Hicom stated that Monday is the day that they would purchase over the Proton national carmaker at about three billion ringgit or $957 million. This way, the deal will greatly help in the revival of the Proton’s fortunes. The particular event will take place for the reason of improving Proton’s technology, styling and image. Due to fierce completion Proton which was one of the road kings, sees that its market itself continuous to dwindle. Perodua overtook Proton, which was the Malaysian’s car best sellers of 2006 and retained its kingship back in the year 2011 with of course a 30% market shares. Recent cars were made and improved by manufacturers. One of the recent events held in the Pebble Beach, the unveiling of the Infiniti was tremendously a shout from the crowd. The new and stylish Infiniti took attention from car seekers, fanatics and other enthusiasts that cameras begun flashing to capture a view of the prestigious car. Fans from different places all gathered from this place to witness the unveiling of different cars, and one of the cars that held much attention is the Infiniti. Infiniti had revealed yet another image of the newest 2011 M Sedan that had become the buyer choice of those who had witnessed it. Many would approach the said car to look closely at the finely crafted hood with high quality tints. Using a form of clay model, which is projected via computer image, the Infiniti surely had found its way to the right place to raise its new flagship; with added bold, new and high quality styling added displacement on its hood. Hence, the newest M had improved better what’s already had to the most perfect Japanese performing luxury sedans all throughout the world. The car was said to offer engine choices that would either be at 3.7 liters VQ which is also the same as G37 and 370Z or even for a new version of 5.6L V8 that’s up to the liter of the current 4.5 V8 of the car. Dramatic comments rained over the car and many people are surprised to look at the model of the car checking out the features like 400 horse power, which is highly sustainable. 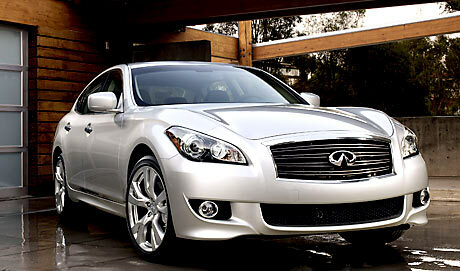 The interior of the Infiniti M is packed and comprises of quality materials that highly made by specialized experts. Audiences who got the chance to view the newest Infiniti M got to look at the car closely. Many experts said that the materials used in making the car are considerably luxurious and are made with great quality. The exterior styling of the car is very gorgeous that mixes the traditional and unique infinity styling and cues that are adapted from high-end sedans. The finished car will be revealed at the Los Angeles Auto Show afterward this year. Fans already await the showcase of the prestigious car that will be coming out from Japan that’ll be on sale as the future generation Nissan Fuga. Furthermore, well-known tuning companies like Mansory, Brabus and AMG are working their ways in developing new tuning strategy for the said car.